Getting the Senterras a tent! Yesterday Marc and I closed the deal on getting the Senterras a tent! We walked over there with Pastor Chris and Erta, found Ticia at her workplace, a house two doors down from where they are living. Ticia is a cleaning woman. We then headed down the street to her house. She asked us to wait a minute, and she ran ahead of us. I was puzzled by this until we walked up to the doorway in the metal gate at the front of the property. I caught a glimpse of Ticia running quickly to the bed that sits in the dirt yard under the banana tree and putting a fitted sheet on it. I then understood. She was making the house nice for her guests. Out of respect, I stopped and waited a minute. When we entered through the doorway, she was patting the sheet. She then stood proudly, smiled broadly, and welcomed us into her home. Two noteworthy things happened yesterday when I was at the feeding program. First, Erta had the kids sing happy birthday to Chris Cannon in both English and Creole, and then they mobbed him and pulled him to the ground. He said it was the best "happy birthday" he has experienced. The other thing was that I was sitting next to Marc Williams on the steps at the Ben's, and Isyanna Senterra was playing in front of us. Marc leaned over and said, "There's something about that girl. I can't put my finger on it, but there's something special about her." That kicked off a conversation which ended with Marc agreeing enthusiastically to adopt the Senterras after I leave here. A couple of posts ago, I wrote about a shift that takes place when you are here for a while. 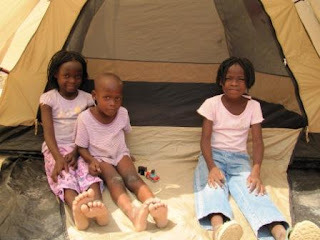 I have realized in the last few days that our orphanage is an island of plenty in an ocean of poverty. Being here for a while has given me the ability to interact with a couple of local families. Their condition is deplorable, and Sunday for a few minutes I found myself buckling under the compassion I felt for them and my inability to do anything substantial about it. 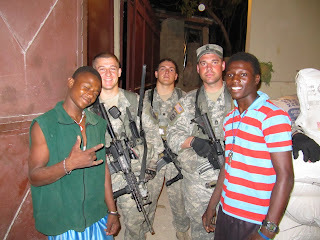 The same day we went to Erta's college, we also drove past the palace and through downtown Port-au-Prince. I had followed coverage of the earthquake on CNN pretty closely before I came here, but nothing could prepare me for what I saw... and smelled. My camera battery died as we entered downtown, so I will post one photo that gives you a feel for the place. But photos cannot tell the story there. Downtown consists of larger buildings, typically three to five stories tall. Well, they used to be that. I would estimate that 80% of the buildings in that area are either all the way crumbled or badly damaged. For about a square mile or two, every street is a surreal jumble of vast piles of rubble and buildings tilted at crazy angles. And this is the cleaned up version of downtown. Captain Mike Anderson of the 82nd Airborne said that three weeks ago, you couldn't even drive through that area because the rubble was strewn through the streets. Today I got to take a ride through parts of the city I hadn't seen. The first destination was a very important spot. We went with Erta to the University Concorde. Erta was in a classroom in the college building when the earthquake hit. Erta was trapped in the building for a short time, but she miraculously crawled out with only a sprained ankle. I will tell Erta's story more completely in a separate post. Today as I was walking toward the boys' home after lunch, I was surprised to find some new little friends sitting outside the Ben's. 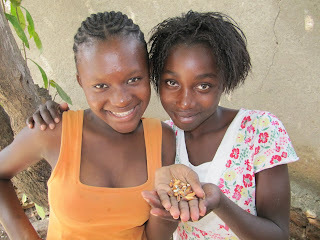 It was Isyanna and Geneveau, the two girls I became attached to at the fasting gatherings over the weekend. Isyanna is 9, Geneveau is 8, and they had with them their younger brother Lickson, who is 5. I think they also have an older brother. I was delighted to see them, and we played together for about a half hour before they were allowed to enter the Ben's for the feeding program. I didn't know before then that they are feeding program kids. I was told that the girls don't show up that often. We have completed our second day of fasting. The fast goes from 6AM to 6PM, so when I say we completed it, I mean we just ate dinner. Tonight was MRE night. MREs, or "Meals Ready to Eat," are the pre-packaged, calorie-intensive meals that soldiers eat when they are out in the bush. We have accumulated about three dozen MREs of various dishes in the depot, so each of us descended into the depot and went "shopping." Anticipation and excitement ran high. However, the actual taste of the meals was a letdown for just about everyone. We all decided that Brooke's enchilada appeared to be the best of a bunch of bad meals. But, hey, any of those meals is better than going hungry! 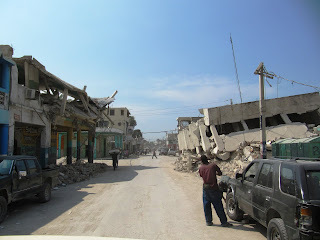 It is one month since the earthquake, and all across Haiti, people are fasting and praying. Every once in a while, we can hear people singing at houses around our neighborhood. And they can hear us. There are about 80 or 90 people gathered in The Ben's, where we are singing songs and praying. 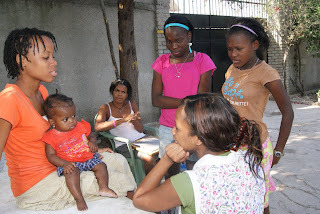 The Haitians spontaneously worship and pray, and this morning Susette and I brought something from the Word. We are taking a little break to get a drink of water. Now it's time to return to The Ben's. We said a fond farewell to the Firefighters for Christ this morning. Two things stood out in their visit here. First, they were extremely industrious. They worked from morning until night in very hot and humid conditions. They built a tent shelter along a wall on a piece of property that the owner has offered to people who have no place to stay. There are new tent cities all over the city, and the Firefighters took this one on. 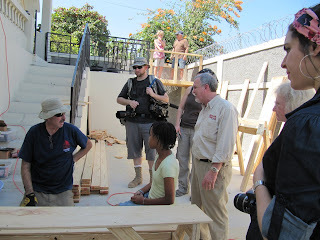 The shelter they built must be one of the most durable tent structures in all of Port-au-Prince. Second, the Firefighters consistently lift up the name of Jesus. In all they do, they want the name of Jesus to be proclaimed... not just the name of God but the name of Jesus. Today I started the day having devotions with the Firefighters for Christ. I love those guys! And when we pray and worship together, I can feel God's presence. It really gets me ready for the day. Then I led a Bible study for the older boys. We are going to work through Philippians, going as far as we get before I have to leave. The highlight of the morning: "he who began a good work in you will carry it through to completion..." This hopeful message from Scripture is critical for Haitians to hear following the earthquake. 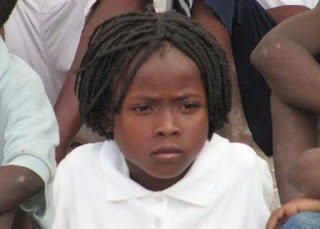 Many people lament that "Haiti is broken." 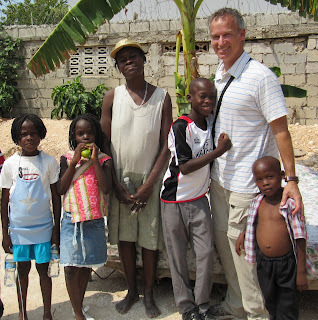 But if God has intentions for Haiti, he will carry them through to completion. No earthquake can stop that. Internet! Our service was restored today. Hooray!! The problem was that our antenna was linked to a service town that had fallen down. Today the technicians linked us to a different tower, and all is well. Last night we had most welcome visitors! At 12:30 AM the 82nd Airborne visited us again. They came by to drop off a shipment of rice and check on our security situation. It was good to reconnect with Captain Mike Anderson. I like that guy, and not just because he commands a platoon of soldiers who can protect us from those who mean us harm. He seems to be a quality human being. And I will admit that it is no small thing to learn that he and his men are patrolling our area on a regular basis. First a quick apology... we still don't have internet at the guest house, and I am borrowing a computer at the Manasseros' house again. Sorry for not updating you the last few days. The Firefighters are working on three big projects. First, they are building desks for us to use for all the MDL kids. If school is not going to restart, we will find a way to keep our kids learning anyway. We hope to bring in some teachers and restart school ourselves. Today we received a delivery of supplies from Unicef. We have accumulated quite a store of supplies that are being used to care for families in the area. There is a regular stream of people coming through who are in need of food and various things. Yesterday I was pretty much laid out with a stomach ailment. Now I am feeling better, thank God. I want to concentrate on doing what I came here to do: provide pastoral care to the folks of MDL. Pretty much everyone here is suffering from post-earthquake stress and/or grief from losing loved ones. I haven't talked to anyone yet who is unaffected. It's quiet at the Guest House now. I wanted to write about a few highlights from yesterday and today. Yesterday was Sunday, and we went to church at Quisqueya Chapel, which is a block from the boys' home. The building was large and packed out. 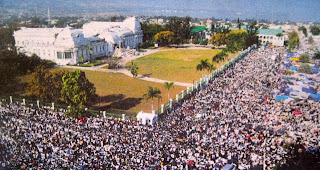 There must have been 500 people there -- Haitians but also many people from around the world. The service was in English. The highlight of the service was when Ariana and her friend Ruth got up and sang "The God of this City." They prefaced the song by relating that when the earthquake hit, they were both singing this particular song, even though they were in different parts of the city. 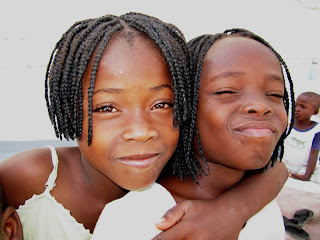 Ari was on the second floor of a school building with her cousin Nikki, looking out over Port-au-Prince and singing the song. Ruth was on a rooftop, looking out over Port-au-Prince, writing down what she wants God to do in Haiti in 2010, and singing the same song. That's amazing in itself... and maybe prophetic.